The 5 Senses of Christmas in Preschool! Materials needed: One Christmas Textures Recording Sheet.pdf per student (linked above), crayons or pencils, and assorted Christmas items with various textures for the children to feel and explore. 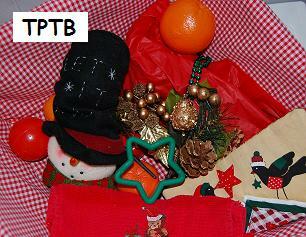 Set the assorted Christmas items out in bins or baskets so that the children can explore the various textures inside. Make sure to include items that are smooth, soft, fuzzy, bumpy, prickly, etc. so that they children are exposed to a wide variety of textures. Help the children record the name of the item on each line of the recording sheet. Younger children can copy or trace the words. Older children could write/copy the name onto the recording sheet. As the children feel the different items/textures, have them circle the happy face if they like the feel of the item or a sad face if they do not. Fill each of the containers with small amounts of the items you are using that give off a different scent or smell (see below for suggestions). Next, cover the containers and using a thumb tack, poke several small holes in the tops of the film containers or in the aluminum foil. Then have each child take a turn smelling the tops of the containers to smell what is inside and try to guess/figure out what the item is. 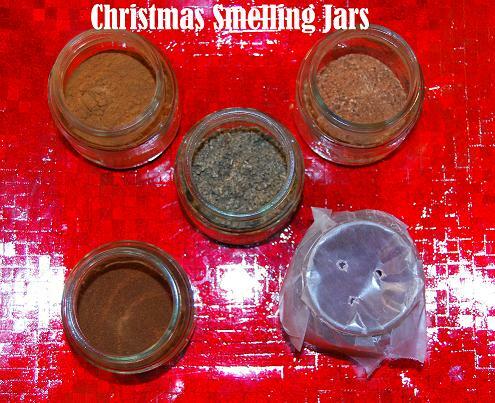 Using the Christmas Smelling Jars.pdf provided, have the child decide and color in if they think the item smells good, bad or just OK. After smelling and recording their preference for each of the containers, then go back and uncover the container and see what was inside and what they actually smelled. Next, have the child write, draw or glue a picture of what was in the container. Suggested items include: ginger, vanilla extract, eggnog, cinnamon, cloves, peppermint (candy canes), evergreen, etc. 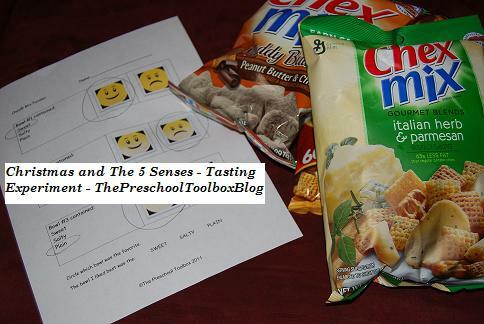 Pre-packaged Mixes are great to use for this activity! PLAIN – Use any crackers, Chex® cereals, and/or pretzels that your children like and mix together. Do not add any flavors, candies, or additional salt to this mix. Print the recording sheet linked above for each of the children. The tongue can only tell four kinds of taste – sweet, sour, salty, and bitter. Since sugar and salt have a very strong taste, the children will reply on their taste buds to solve the puzzle. Make the recipes above and put them into 3 separate bowls. Have the children close their eyes and pass out samples, one-at-a-time, of the 3 kinds of Chex® mix. Without looking, the children must rely on their sense of taste to determine if the sample was: Sweet, Salty, or Plain. Have the children fill out the recording sheet after each sample is tried. When all 3 varieties of the Chex® mixes have been sampled, ask the children which kind was their personal favorite. Have the children circle the answer on the recording sheet. Materials needed: Assorted items with different sounds (ex: jingle bells, small counters, balls, rice, beans, small stones, etc.) and 8 small containers to hold the items. 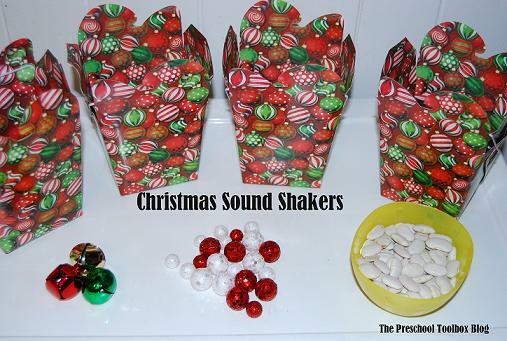 We used small Christmas gift boxes for this activity, but you can use any containers that are available. Some suggestions: red and green plastic eggs, Christmas cookie tins, small plastic containers with lids, cardboard tubes sealed with waxed paper at both ends, empty milk cartons, etc. Fill 4 containers with different items. Make a second set of 4 containers that are filled with identical items (there will be 4 pairs of matching shakers when finished.) Set the containers out on a table or a floor. Have the children shake the containers and try to determine what is inside by the SOUND it makes. If desired, you can chart the responses from the children while introducing the sound activity. Let the children explore the shakers and try to match the ones that sound alike. When finished, there will be 4 pairs of matching shakers. After the children have had time to match the sounds and explore the shakers, reveal the items inside the containers. Did the children guess correctly? This activity can be done over and over by exchanging the items that are inside the containers. Christmas lights have a magical quality for children (and most adults, too). Take your children on a walk or on a drive, bus ride, etc. to view Christmas light displays during the month of December. Point out the colors that you see and ask your children to look for specific colors in the displays. Print the Christmas Lights and Colors file (linked above) and complete with your children. Extension activity: Have your children go on a “colors hunt” in the classroom or at home. Make assorted colored circles on a blank sheet of paper. Have your children make tally marks beside each color of circle when they find an item of the same color. For MORE Christmas Activities, see the Christmas Theme here on the blog! « Christmas Arts and Crafts for Kids to Make!